Reformation is my go-to for feminine cut dresses and tops but their sweaters this season have me all kinds of excited. I'm loving this slightly cropped pullover with a classic crew neck and an on-trend rib detail. This slim-fit sweater is a alpaca wool blend knit and of course, in true Ref style, sustainably-made. 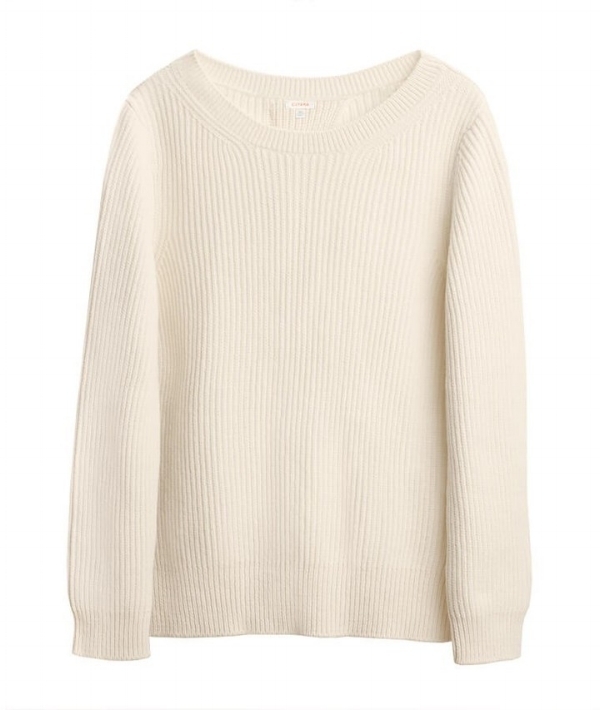 Everlane has been killing the sweater game this year and their newest additions of affordable cashmere has blown me away. This easy hoodie version is cozy enough for the cooler temperatures and proudly produced ethically at one of the company's factories in China. I'm looking forward to styling this under a denim jacket this season. This knit by one of my favorite companies, Doen, has a slightly high neck and full sleeves, which sets it apart from the classic pullover. In a supersoft alpaca knit, this is an adorable piece for winter that will look great with jeans this season. This Fisherman sweater from fair-trade pioneer, People Tree, is made of 100% ivory wool and is the perfect chunky knit for your best après-ski look. I love its slouchy shape and contrasting weave patterns and think it would look perfect paired with a feminine skirt or trousers. 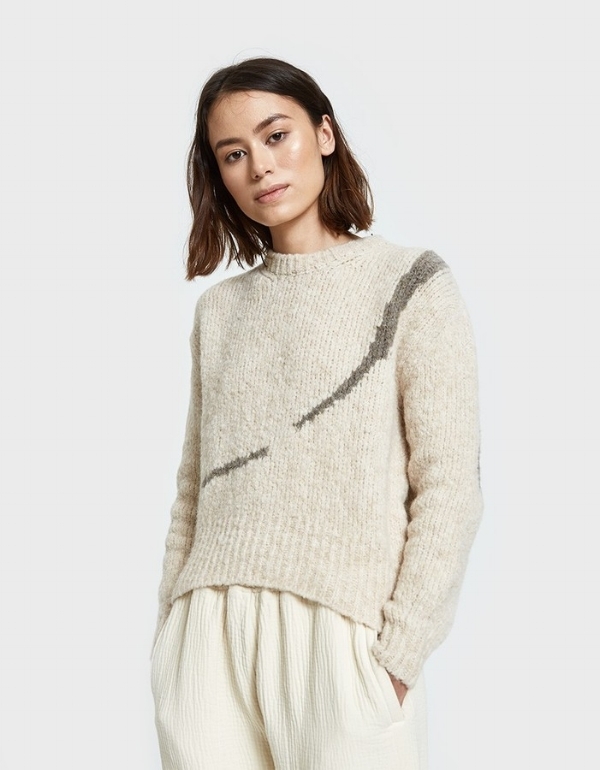 This ivory plush sweater from Paloma Wool has a subtle contrasting brushstroke detail that's super cute. With a classic crew neckline and a slightly cropped and boxy shape, this knit is proudly made in Spain and can be worn anywhere, anytime. Lily Ashwell designs each of her pieces at her studio in Venice, CA and her sweaters are lovingly knit by hand by women in Bolivia. This sweater, in particular, is the perfect balance of vintage coziness and cool girl style and has a shrunken, boxy silhouette which is super edgy this season. The Long Cardigan by Vetta Capsule will most likely be the most versatile sweater you'll ever own. Made in the USA from deadstock sweater fabric, this is an easy piece to throw on, whether over a simple black dress or paired with jeans and a t-shirt. As it's part of a capsule collection, this cardigan can also be buttoned up and worn as a sweater dress, either with buttons in front or back. A super simple and versatile piece you can wear again and again for fall/winter! Maybe it's because I just binge-watched Stranger Things Season 2 (how good was it?! ), but regardless, I'm digging the nostalgic colors of this striped knit sweater. From the Dutch sustainability brand, Kings of Indigo, this sweater is made from recycled fabric with an oversized, relaxed fit that looks borrowed-from-the-boys. The Acey, an online destination for consciously created brands recently produced their own line of knitwear with a family-run factory in Scotland and have effectively created high quality products with minimal waste. Their grey fleck turtleneck is super soft and made from a merino wool and cashmere blend. Made from Italian merino wool and cashmere, this cozy sweater has an unexpected geometric cut at the back for an edgy twist on the classic pullover. Designed by the brand in San Francisco, this sweater is carefully made by artisans in Italy and perfectly embodies Cuyana's 'fewer, better' philosophy. Does a turtleneck count as a sweater? I don't know. But, I do know that this ribbed turtleneck by Lacausa is the perfect staple for colder months. Made ethically in downtown LA, this turtleneck has a nice slim fit, making it perfect to tuck into high-waisted jeans or layered underneath a cool slip dress. This crew neck knit cardigan by conscious New Zealand brand, Kowtow, is made from 100% ethical organic cotton and recycled hemp buttons. I love the rolled cuff sleeves and the on-trend camel color and think this would look pretty cool over some old overalls this season. We're back to Everlane because like I said, this transparent company is killing it this season. This super-soft cashmere sweater with a cool mockneck is slightly cropped and a tad oversized. Plus, it comes in this millennial pink color that I can't resist. The Vina Turtleneck Sweater by ethical brand SiiZU is made from quality 100% Italian Merino Wool, which offers natural sun protection (how cool?!). I love the drop shoulder and the absolutely perfect baby blue color; perfect when paired with a pair of medium wash high-waisted jeans! Made in the USA by socially-responsible brand, Amour Vert, this short, boxy sweatshirt is made from sustainably sourced organic cotton french terry. A soft, casual crew neck; perfect for everyday comfort.